Despite significant advances in the treatment of complications requiring intensive care unit (ICU) admission, ICU mortality remains high for patients after allogeneic stem cell transplantation. We evaluated the role of thrombocytopenia and poor graft function in allogeneic stem cell recipients receiving ICU treatments along with established prognostic ICU markers in order to identify patients at risk for severe complications. At ICU admission, clinical and laboratory data of 108 allogeneic stem cell transplanted ICU patients were collected and retrospectively analyzed. Platelet counts (≤ 50,000/μl, p < 0.0005), hemoglobin levels (≤ 8.5 mg/dl, p = 0.019), and leukocyte count (≤ 1500/μl, p = 0.025) along with sepsis (p = 0.002) and acute myeloid leukemia (p < 0.0005) correlated significantly with survival. 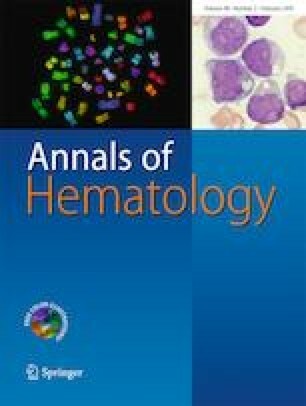 Multivariate analysis confirmed thrombocytopenia (hazard ratio (HR) 2.79 (1.58–4.92, 95% confidence interval (CI)) and anemia (HR 1.82, 1.06–3.11, 95% CI) as independent mortality risk factors. Predominant ICU diagnoses were acute respiratory failure (75%), acute kidney injury (47%), and septic shock (30%). Acute graft versus host disease was diagnosed in 42% of patients, and 47% required vasopressors. Low platelet (≤ 50,000/μl) and poor graft function are independent prognostic factors for impaired survival in critically ill stem cell transplanted patients. The underlying pathophysiology of poor graft function is not fully understood and currently under investigation. High-risk patients may be identified and ICU treatments stratified according to allogeneic stem cell patients’ individual risk profiles. In contrast to previous studies involving medical or surgical ICU patients, the fraction of thrombocytopenic patients was larger and low platelets were a better differentiating factor in multivariate analysis than any other parameter. The original version of this article was revised due to a spelling error of the author name Philipp Wohlfarth. The online version of this article ( https://doi.org/10.1007/s00277-018-3538-8) contains supplementary material, which is available to authorized users. A correction to this article is available online at https://doi.org/10.1007/s00277-018-3580-6. We thank Sabine Fiebig-Kuhnert for the logistical support. TL, WL, and ATT designed the study. EB, WL, and ATT performed the statistical analysis. CS and WL performed the data collection. PW, MM, and FA participated in the data acquisition and analysis. ATT and TL wrote the manuscript. WL, DWB, and CS contributed to the writing of the manuscript. All authors read and approved the final manuscript. The study was conducted in accordance with Good Clinical Practice Guidelines and the amended 1964 Declaration of Helsinki. The Institutional Ethical Review Board of the University Duisburg-Essen approved the protocol (board protocol no. 15–6446-BO). ATT has received lecture fees from Jazz Pharmaceuticals and travel subsidies from Neovii Biotech outside the submitted work. The other authors declare that they have no conflict of interest.